• RubinBrown, one of the nation’s top 50 accounting and business consulting firms, recently promoted Jeff Albach, CPA, CFE, and Ethan Kent, CPA, to partner in the Assurance Services Group. Glenn Goodnough, CPA, CFE, managing partner of the Las Vegas office, made the announcement. Albach’s public accounting experience includes serving clients in a range of industries including construction, not-for-profit organizations, employee benefit plans and other small businesses. He received a bachelor’s degree in business administration for accounting and finance from the University of Nevada Las Vegas. Kent’s 17 years of public accounting experience includes serving clients in a range of industries including not-for-profit, government, employee benefit plans and other small businesses. He received a master’s degree in accounting from Southern Utah University. • Tasha Schwikert-Warren has joined Holland & Hart’s Las Vegas office as an associate in the firm’s real estate and construction practice group. Schwikert-Warren focuses her practice on real estate and property matters, assisting clients with commercial real estate, project development and construction. She comes to Holland & Hart after completing a judicial clerkship in the Eighth Judicial District Court for the Honorable Joanna S. Kishnerand Honorable Mark R. Denton. Schwikert-Warren earned her law degree from the UNLV William S. Boyd School of Law and her bachelor’s degree from University of California at Los Angeles. • Brownstein Hyatt Farber Schreck has announced that Scott Wiegand, former senior vice president, deputy general counsel and corporate secretary at Caesars Entertainment Corp., has joined the firm as a shareholder in the corporate department. Wiegand will split his time between the firm’s Las Vegas and Denver offices and will initially focus on the emerging sports gambling industry. As senior vice president, deputy general counsel and corporate secretary at Caesars, Wiegand provided counsel for the company’s capital markets, corporate transactions and enterprise development efforts and was the corporate officer responsible for securities compliance and corporate governance matters. Prior to that, Wiegand was general counsel at an e-commerce solutions company in the hospitality industry and spent seven years as a corporate attorney with AmLaw 200 law firms. Wiegand is a graduate of Florida State University and Cornell Law School. He is licensed to practice law in Colorado and Ohio and has been licensed by the gaming authorities in Nevada, New Jersey, Louisiana, Pennsylvania, Mississippi, Ontario and Missouri. 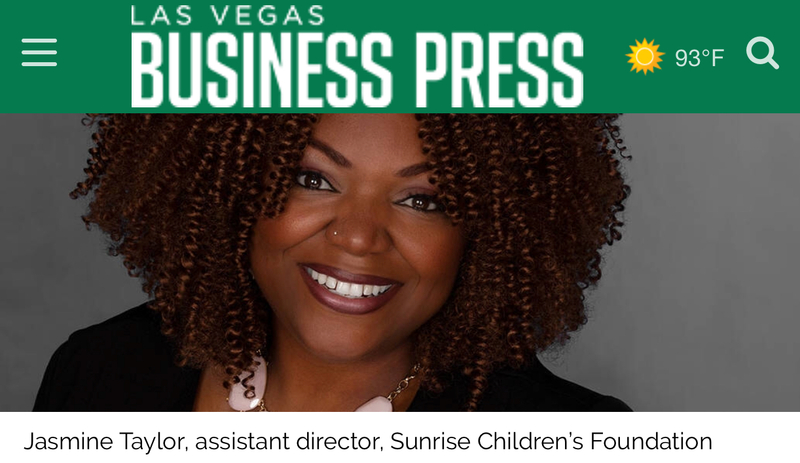 • Sunrise Children’s Foundation, which offers free programs and services focusing on early childhood education, has announced Jasmine Taylor as the new assistant director. Taylor was selected by the Mayors of Compton and Los Angeles to be the president of the RebuildLA Youth Task Force after the riots in 1992. She was a youth activist at the time and has been a public servant ever since. She earned a Bachelor of Science in nonprofit management from USC and a master’s degree in counseling from Dallas Baptist University. She is a Reinhard Mohn Fellow, a National Urban Fellow, speaker, trainer, certified parenting and relationship coach, author and ordained minister. Taylor has spent the last eight years in Dallas, both as a regional director in early childhood education for KinderCare and vice president of programs and services for a family service agency in Dallas. As an LA native, she grew up spending summers in Las Vegas with her family, but is a relatively new full-time resident. • The Howard Hughes Corp., developer of Summerlin, has promoted two executives to senior vice president. Julie Cleaver was promoted to senior vice president, land planning and design; and Randy Ecklund was promoted to senior vice president and executive director, Summerlin Community Association. Cleaver, who joined The Howard Hughes Corp. in 2005, directs all current and long-range planning efforts, including entitlements and the development and design processes, for the 22,500-acre master-planned community. Most recent efforts include land planning for 5,000-plus acres in Summerlin West and Downtown Summerlin, home of City National Arena — practice facility for the Vegas Golden Knights; and coming soon, Las Vegas Ballpark, a AAA baseball stadium and future home of the Las Vegas 51s. Her leadership and broad experience in the land development industry ensures innovative and sustainable planning solutions that promote place-making and encourage smart-growth strategies for the community. Active in the community, Cleaver served on the Healthy Communities Committee for the Southern Nevada Strong regional planning initiative, as well as the Regional Transportation Commission’s Transportation Investment Business Plan Committee. She is a current member of RTC’s On Board Committee and serves as a member of the board of directors for the Southern Nevada Chapter of NAIOP, as well as a member of its Executive and Government Affairs Committees. She has also been a speaker on programs presented by Urban Land Institute, American Planning Association, NAIOP and the Las Vegas Metro Chamber of Commerce. She holds a Bachelor of Science degree in business administration from UNC-Chapel Hill and a Bachelor of Science in landscape architecture from The Ohio State University. Ecklund joined Summerlin in 1992 as executive director of the Summerlin Community Association and Summerlin Council management operations. He and his team oversee day-to-day governance administration, property management and maintenance, accounting and finance, residential design review and residential deed restriction enforcement for the Summerlin Master Associations and The Ridges Community Association. In his role, Ecklund also manages the Summerlin Council, the nonprofit arm of the Summerlin Master Association that includes all community amenities, such as parks, trails, community centers, recreational facilities and community programming. He has more than 30 years’ experience in community management. Ecklund holds a Bachelor of Science degree in psychology from Western Illinois University. He earned his professional community association manager (PCAM) designation from Community Associations Institute in 1999 and certified manager of community association (CMCA) designation from the National Board of Certification for Community Association Managers in 1996. • Touchstone Living has promoted Jennifer Gonzalez to the position of director of marketing. Gonzalez joined Touchstone Living in December of 2017, she came with 15 years of professional marketing experience within the new homebuilding industry. As the director of marketing, Gonzalez will oversee all areas of public relations, model complex presentation, website management, advertising and promotional exposure. In addition, she will be responsible for the management of the marketing department and its employees, as well as the creation, implementation and adherence to budgets for bringing awareness to existing and future new Touchstone Living communities.